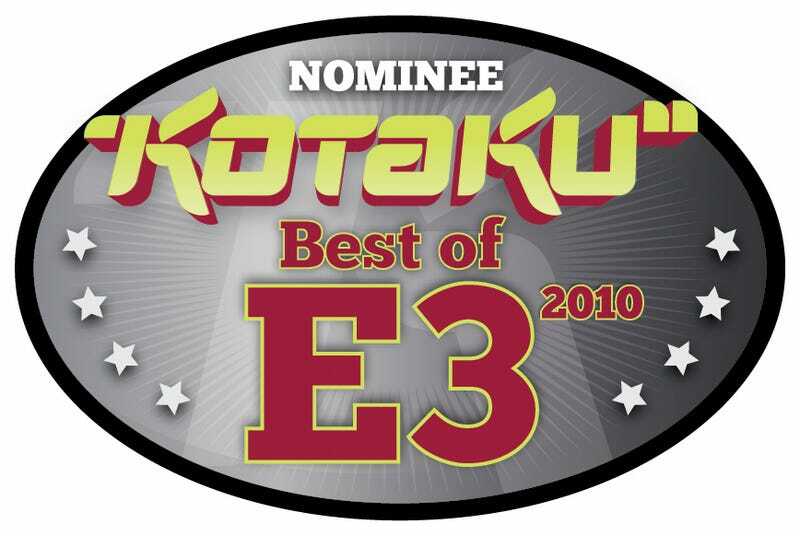 While we've been judges for oodles of other people's best of E3 awards, we've never actually done our own. And there's a reason for that: They're really hard work. Just ask Geoff Keighley. But we figured that it was probably a good idea for us to start. Take a moment, if you'd like, to check out our list of nominees for best of E3 this year and let us know what you think. We'll be declaring the winners next week. Also, we'd love to hear your take on our categories. It shouldn't come as a surprise to those of you who are regular readers that we didn't include a break down by genre. Day 1's FEAR 3 for the PS3, Xbox 360, PC : Fettel and Pointman dichotomy. Lionhead's Fable III for the Xbox 360, PC: Weapon morphing. Ubisoft Reflections' Driver San Francisco for the PS3, Xbox 360, Wii, PC: Disembodied car swapping. Yager's Spec Ops The Line for the PS3, Xbox 360, PC: Use of sand. Ninja Theory's Enslaved: Odyssey to the West for the PS3, Xbox 360: Trip and Monkey's relationship. Splash Damage's Brink for the PS3, Xbox 360, PC: Button-free traversing. Hudson's Lost in Shadow for the Wii: Use of shadows. Epic's Bulletstorm for the PS3, Xbox 360, PC: Reverse bullet-time. Fire Hose Game's Slam Bolt Scrappers for the PS3: Mix of building and brawling. Tiburon's EA Sports MMA for the PS3, Xbox 360: Submission holds.